Once you start enrolling contacts in your sequences, you can monitor each sequence's performance. Analyzing their performance will tell you which sequences elicit more replies and prompt more meetings booked, and which sequences may need to be customized further. After you enroll your contacts in a sequence, you can monitor their performance directly on the sequence dashboard and on the summary page for each sequence. On the sequences dashboard, the data in the Reply Rate and Meeting Rate columns allows you to analyze how your sequences are performing. To view open and click data for an individual sequence, click the sequence name. At the top of the summary page, use the dropdown menus to filter sequence data by a specific time range, or enrollments by a specific user. Total enrolled: the total number of contacts enrolled in the sequence. Open rate: percent of enrolled contacts who opened any email in the sequence at least once. Click rate: percent of enrolled contacts who clicked a link in an email sent from the sequence at least once. Reply rate: percent of enrolled contacts who replied at least once to any email sent from the sequence. Meeting rate: percent of enrolled contacts who booked a meeting while enrolled in the sequence. Unsubscribe rate: percent of enrolled contacts who unsubscribed from the sequence. Bounce rate: percent of enrolled contacts whose email address bounced while enrolled in the sequence. The table below the overview report shows metrics for individual email templates sent in the sequence. Please note: HubSpot will not record open and click data for any contacts enrolled in your sequences prior to February 1, 2019. Because of this, individual open and click data for a specific email send will not match the summary totals. If you want the individual metrics to match the summary totals, clone the existing sequence and enroll contacts from the clone. However, data from the original sequence will not be included on the cloned sequence's summary page. Learn more about this change on the HubSpot Community. The table at the bottom of the sequence summary page shows data about the recipients enrolled in the sequence. At the top left of the table, click the Status dropdown menu to filter your contacts by their enrollment status. Next to the recipient's Status column, click the Actions dropdown menu to email, call, create a task, or manually unenroll the contact. You can review data about your sequences' performance on your reporting dashboards. In the upper right, click Add report. In the left sidebar menu, navigate to Sales > Sequences. Here, you'll see four reports you can use to analyze your sequence performance. 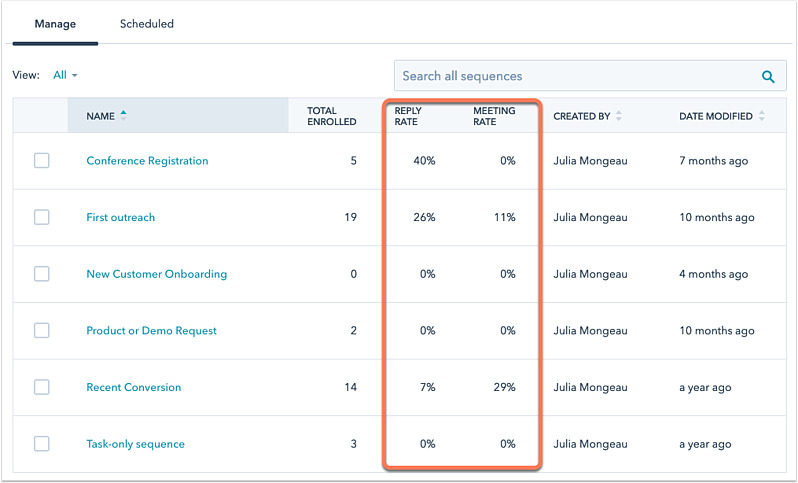 Sequence Reply and Meeting rates: analyzes the total enrolled contacts in each sequence and how they are engaging with your sequence. Sequence Replies by Step: reports on how each individual step in your sequence is performing. Top Sequences by Reply Rate: reports on sequences with the highest reply rates. Top Sequences by Total Enrollments: reports on sequences with the most enrolled contacts. To add the report to your dashboard, click Add report. If you are a Sales Hub Professional or Enterprise user, you can see an overview of your sequence performance in the sales content analytics tool. At the top of the report, click the Date range dropdown menu to analyze your sequence performance over a specific time period. If you select a date range consisting of a week, the default starting day is Sunday. The first report shows an overview of how contacts are engaging with your sequences. The table below the overview report shows the performance of each individual sequence. To modify a sequence, click the sequence name. You will be redirected to the sequence editor where you can make any necessary changes. To edit the metrics displayed in the table, in the top right, click Edit columns. Select the checkbox next to the properties to display, then click Save.